NEW EDITION: Brand new designed jacket, added higher resolution & redesigned illustrations. - These Animals... Don't Want To Wash! - These Animals... Don't Want To Eat! - These Animals... Don't Want To Sleep! What are certainly the most occurring moments in a parent’s life? When their child doesn’t want to wash, eat, sleep, go to school, share, take medicine, get vaccinated... And what can a parent answer to these refusals? 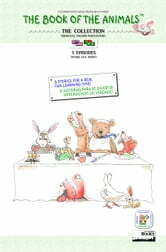 The successful “Book of The Animals” bilingual children’s books series was created with the aim to help both parents and children to discover the benefits of washing, eating, sleeping, going to school, sharing, taking medicine, getting vaccinated... in a fun as well as educational manner. 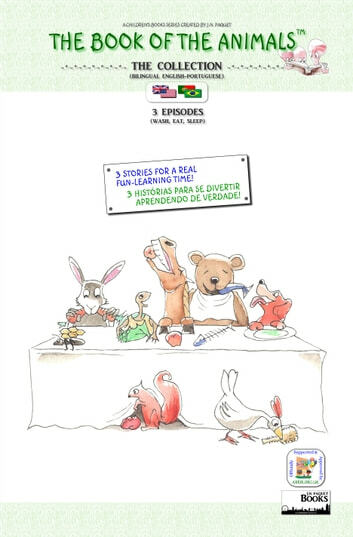 Since the books are also bilingual, parents will enjoy the teaching and the interactivity they can gain from reading them with their children. The books are geared towards children aged 2-5, before elementary/primary school. They will likely be bilingual children whose parents want to encourage the learning of their two current languages. They will also be children whose parents want to teach a language at a young age. Some teachers have also been using the books of the series as a way to teach a second language to children, with themes easy for them to both understand and memorise. There are currently seven books in the series. Each episode brings on new animals, new words, new situations and new stories. More versions still to come! The books are very suitable both for reading to young children and for older children to use to learn to read in both languages. They might even persuade them to wash and eat their dinner! The repetitive structure is supportive of children learning new words and the illustrations work well alongside the text to help understanding of unfamiliar words. I can easily imagine young children demanding repeat readings and enjoying learning the text by heart as many children do with favourite stories. Children learning to make up and write their own stories might well want to write a personalised version, using the structure as a prop. I think the stories would work well both in the home and in the classroom."